At the change of year, the whole of Vienna is given over to partying and dancing. The New Year’s Eve Trail in the Old City is the highlight. A great ambience can be enjoyed as much at a gala dinner or festive ball as it can at a concert, the opera, in a hip club or a sophisticated bar. Superb exhibitions and a dazzling array of events, concerts, operas, operettas and the hit musicals "Mary Poppins" and "Mozart!" promise a New Year's Eve program brimming with excitement throughout the day and night. 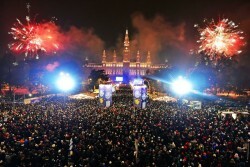 On December 31, Vienna's old city center transforms into a giant party zone: From 2 p.m. in the afternoon to 2 a.m. the following morning, top entertainment is guaranteed by the New Year's Eve Trail in the city center, at City Hall Square and in the Prater.